In a word: They've got the eye of the taguara. Darby ate the parrilla callejera and tostones with papelon con limon. Dave ate the patacon pisao. JM ate the hamburguesa de peril. Nichole ate the perritos with a hot chocolate con queso blanco. Darby and Dave gave La Taguara an A; JM and Joshua gave La Taguara an A-; Nichole gave La Taguara a B+ (see our grading rubric). La Taguara's in the spot Dimitri's Gyros was, and the difference is night and day. The space is still smallish, but the care taken by the place's new caretakers is evident in everything from the staff (who's prepared to recommend everything on the menu) to the vastly improved bathroom. First and foremost, La Taguara is Venezuelan. We've heard folks describe Latin American cuisine "pretty much just meat," but LT goes the distance to make it a little more special. For example, JM got a hamburger. You might think of a hamburger as a cheat (and in some ways it was, since by ordering it he was able to avoid that one ingredient on each of the other dishes that he didn't want to eat). 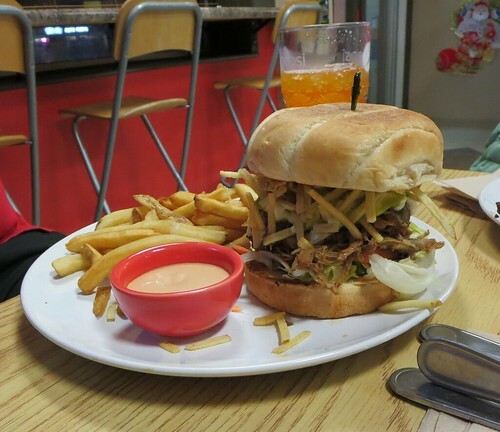 But even on just a burger, La Taguara provided an interesting green guasacaca sauce and spices, which produced a pretty tasty sandwich. Dave and Darby are regulars at La Taguara, and they opted for dishes that played to the strengths of the place. 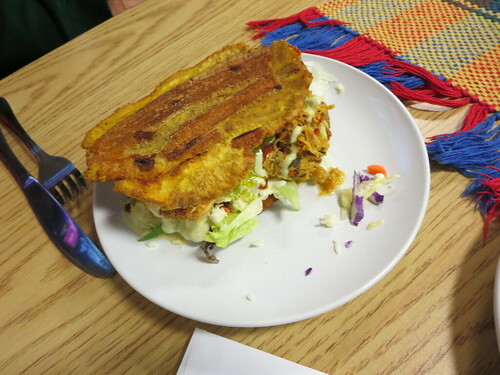 Dave's patacon was a healthy-sized sandwich of fried plantain filled with meat and veggies, which all disappeared quickly. Darby's tostones were "amazing" as they consisted of "crispy, salty deliciousness." The parrilla callejera was a grilled meat and veggie sampler plate of many wonders, too. 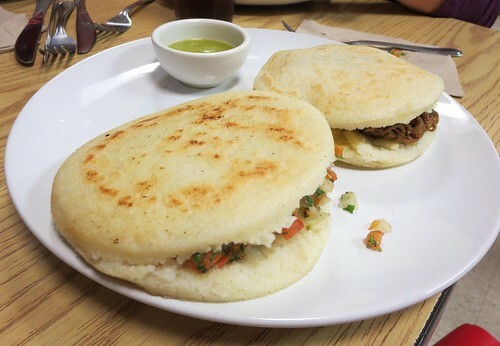 Joshua hewed closer to the familiar, but even then, the arepas filled with shredded beef are a go-to item here. He was not disappointed, though they did get "boring" after many bites. There are beverages to explore here, too. 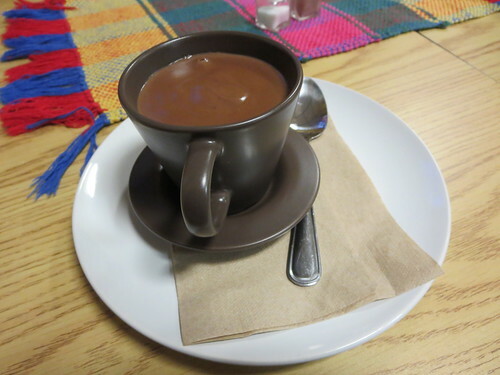 While the papelon con limon was just okay, per Joshua, Nichole found the hot chocolate con queso blanco really neat. It was like a cup of hot pudding (think Chocolaterian's Parisian hot chocolate) with squeaky white salty cheese curds on the bottom. As for food, the shoestring-potato-topped hot dog was interesting, but not very representative of the menu. She sadly never got the lentil soup she ordered, which sounded good for a cold night. 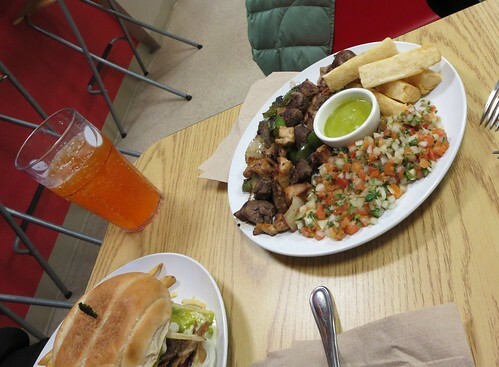 As Madison's dining scene incorporates more Latin American cuisine (is zombie Magnus the harbinger of more in a city that likes Inka Heritage and has a churrascaria, but didn't go much for El Corral, Pollo Inka or Fiesta 38? ), it is nice to see that there is a high benchmark to compare against new places.